After hearing so many good things about this book, I was looking forward to reading it myself. And I have to say that it's definitely worth the hype. Karou is an art student who lives in the wondrous city of Prague. She's also the member of a family of monsters. Brimstone is her guardian. He has a shop that deals in wishes, and gets her to run a bunch of errands for him. Errands that take her all over the world, via magical doors, and has her gathering teeth. She enjoys her job and loves her art, but she's filled with many questions that Brimstone doesn't want to answer. She also feels as if something's missing inside her. Something she's sure she's lost, but can't remember. However, the day she meets the wrath of an angel, her life is thrown into a downward spiral that separates her from her family, and challenges everything she's grown to believe about Elsewhere. Suddenly, she's feeling things she doesn't understand. The most baffling being her connection to this strange angel who is throwing her life into chaos. 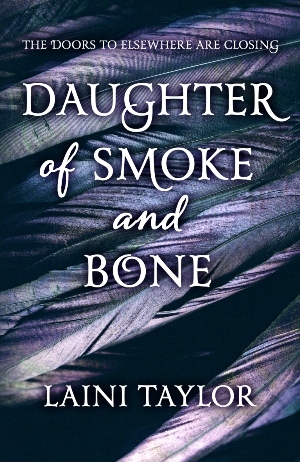 Daughter of Smoke and Bone is a beautifully written and intriguing book. The more I read, the deeper I got into the mystery surrounding just who/what Karou really was. The story also got better with every chapter, leading to an amazingly, unexpected end. One which answers a lot of questions, but also paves the way for many more. This was a truly wonderful journey into a dark, elaborate world of fantasy with a very human backdrop. I absolutely loved every minute of it, and can't wait to read more.